My district has been focusing on formative assessment strategies for years, and for that, I am very grateful. We as teachers have been provided with tons of professional development about the topic of assessment, with strategies to gauge understanding and adapt instruction. One "a-ha" moment I had on my own, though, without reading an article or hearing anything about it at a meeting, is the idea of variety. While I had heard about providing various formative and summative assessments to students, my "a-ha" moment was about the purpose of variety. 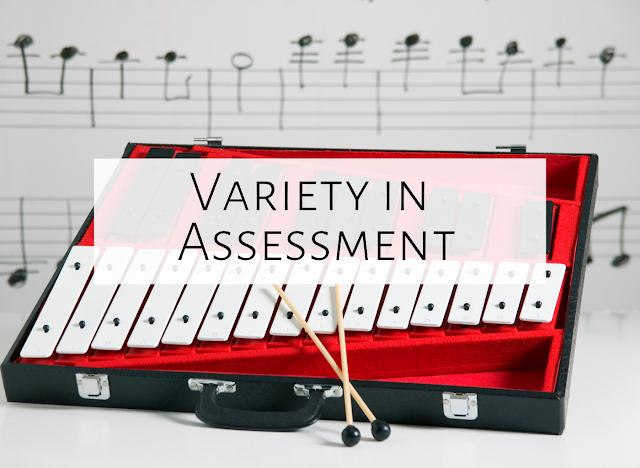 The purpose for variety became clear to me one day when I was assessing students on their performance of a piece on Orff instruments. My good friend Andrew Ellingsen had presented a wonderful piece at an OAKE conference that I had decided to use with my own students. (Andrew, by the way, is an incredibly talented presenter if you are looking for someone to ask to present!) When Andrew first presented this piece, I thought, "Wow, I LOVE this piece, but my students don't have as much experience playing as his do...so I'm not sure they would be successful." Well, as it turns out, just like anything else, if you break down the piece into manageable steps (as Andrew showed us), they can in fact play pretty complicated music! So I stood there that day, listening to my students in centers perform this piece, and I was so excited by how well some of them did! And something seemed very interesting to me...some of these students who were rocking it out on this piece had never really "shined" in music before. They had done fine previously, but had never stood out. And now, they were very fluidly playing this piece of music. But...this was the first time I had assessed them on playing an entire piece on barred instruments (instead of just playing a bourdon or alternating bourdon.) So before this, I had no idea that they would excel so quickly on the instruments. Before this...maybe I had not provided enough variety in my assessments. As I looked back on my assessments from previous years and previous marking periods, I realized that sometimes I'd have two or three assessments all focused on rhythm, or all focused on melody. I decided that, if at all possible, I should provide my students with a wide variety of ways to show their musical understanding during any given marking period. I even found support for this idea online, in an article called "Methods of Assessment" by William Badders. He states, "It is clear that different kinds of information must be gathered about students by using different types of assessments. The types of assessments that are used will measure a variety of aspects of student learning, conceptual development, and skill acquisition and application. The use of a diverse set of data-collection formats will yield a deeper and more meaningful understanding of what children know and are able to do, which is, after all, the primary purpose of assessment." So today I thought I'd offer a wide variety of ways to assess your students during any given marking period, as a means to not only collect a wide variety of data, but for your students to show you how well they understand the many aspects of musicianship. There is such a variety of assessments that can be taken at the barred instruments alone, depending on the grade level. Can students keep a steady beat? Can they alternate between two bars to the beat? Can they play an ostinato? Can they perform a piece like I discussed above? Think about what your goals are for each grade level and plan accordingly. Can students read rhythm patterns? For this, students could use the assessment found in my "Ghost Patterns" set. 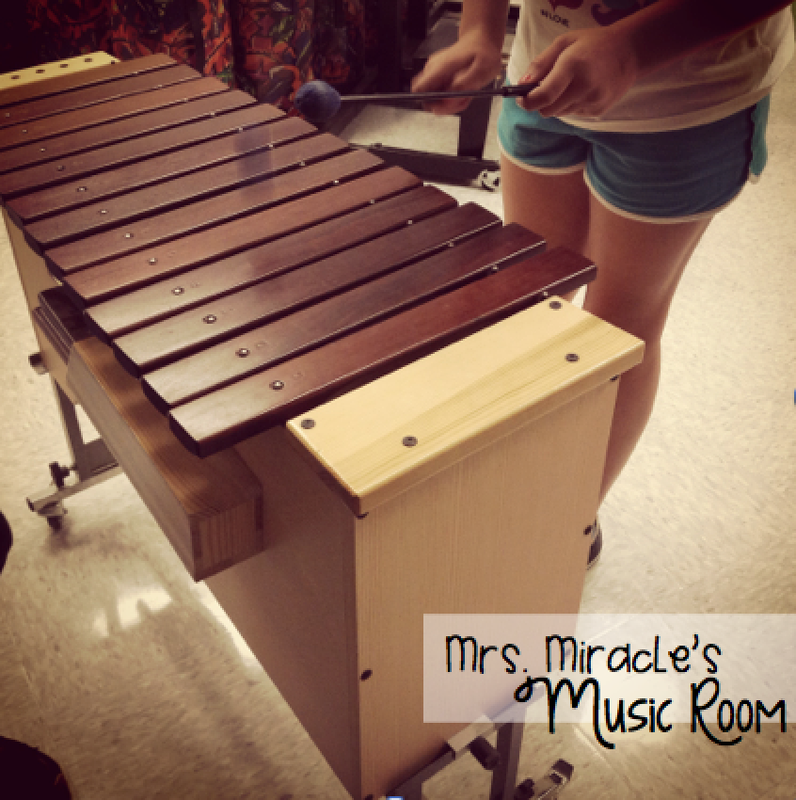 Can students write rhythm patterns? For this, students could use popsicle stick manipulatives to write different patterns, or rhythm manipulatives as shown above. Can students identify rhythm patterns? For this, students could use the "Which animal" game for ta and ti-ti. 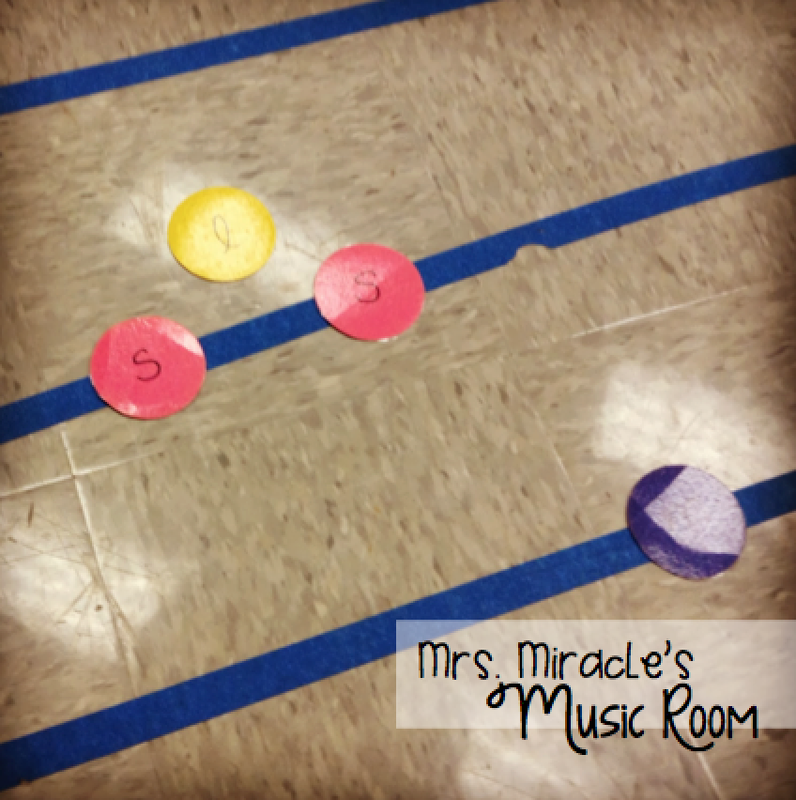 Can students create rhythm patterns? For this, you could clap and say a pattern with ta and ti-ti and students have to say something different back. You could also have them create a composition on non-pitched percussion or barred instruments in C pentatonic! 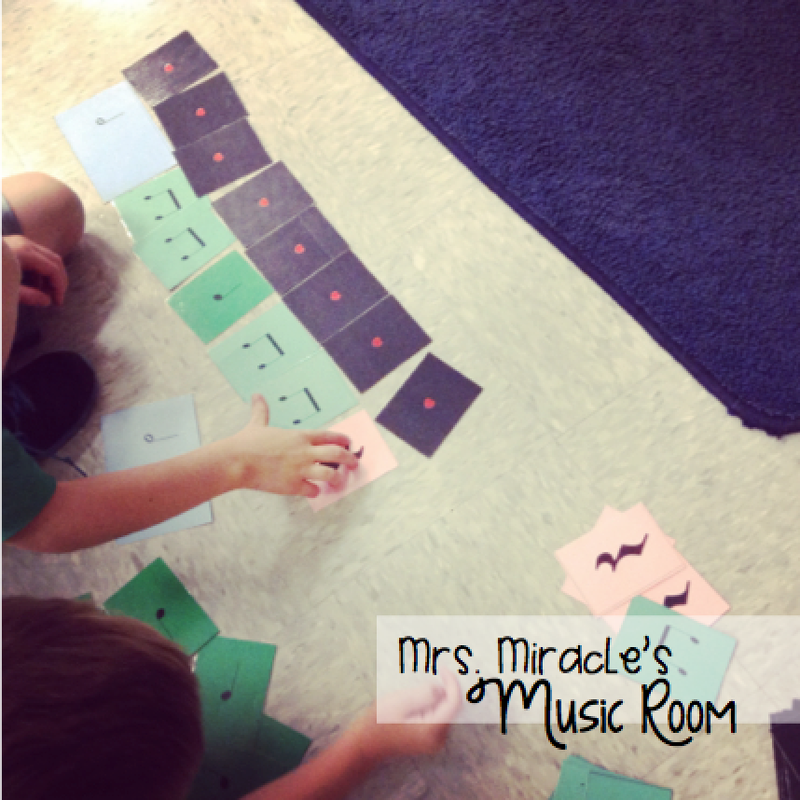 Can students write melodic patterns? For this, students could use solfa manipulatives. Can students write on the staff? I start off with my first graders finding lines and spaces on the staff, like described in this blog post. Can students identify melodic patterns, by sight and/or by sound? For this, students could use the "Under the sea stick-to-staff" game for sol and mi; you can download a sampler for free here. Can students create melodic patterns? For this, you could sing a pattern with sol and mi and students have to say something different back. You could also have them create a composition on sol and mi on barred instruments! 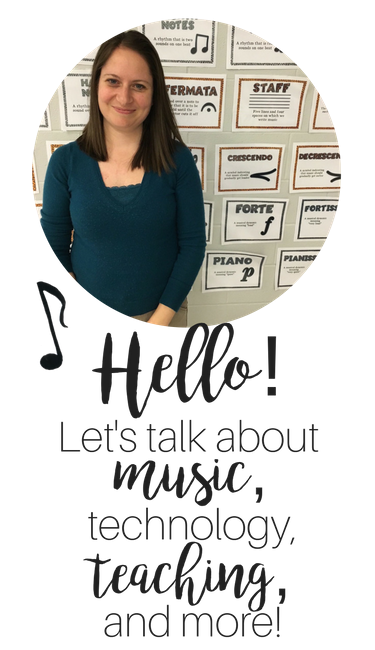 As music teachers, we want students to be able to listen to a piece of music and identify patterns, instruments, moods, etc. We also want students to be able to identify composers and titles of pieces. A great product I've found for assessing listening is Cori Bloom's "Music Listening Worksheets," which gives students the opportunity to articulate what they hear in a piece of music and how it makes them feel. I'm hoping to do a few of these as assessments this year! After students have an understanding of solfa and what it looks like on the staff, I teach them how to transfer that knowledge to identifying letter names on the treble clef staff. I wrote this blog post about my process; I start with lines first, then go to spaces. Here is a freebie you could use to assess their understanding of lines and spaces...students try to get faster and faster in the one minute they have to identify! Let's say we are just looking at one grade level and one marking period; for this example let's use third grade. 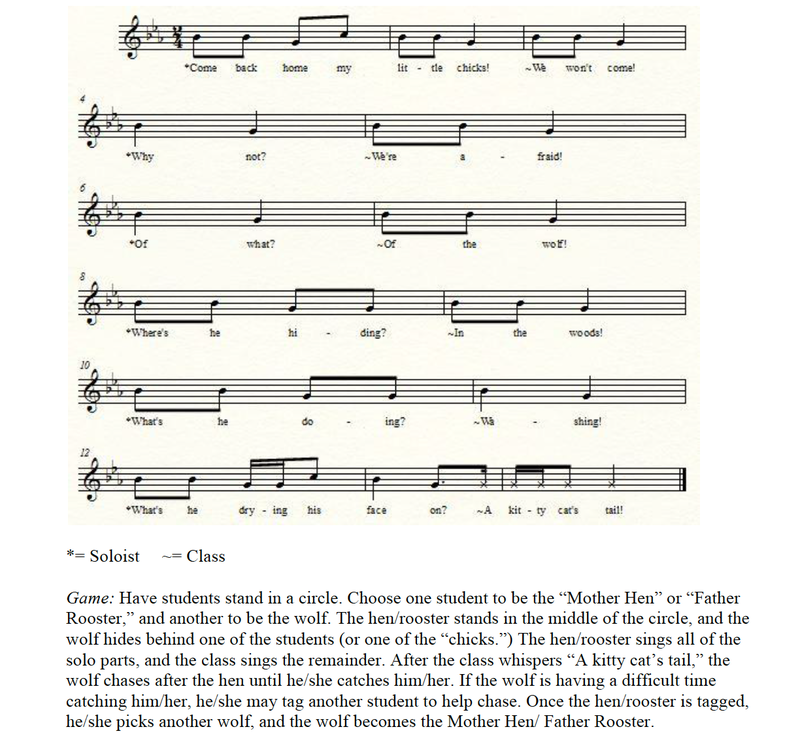 For a true variety of assessments, students may be assessed on their pitch-matching, their ability to identify notes on the treble clef staff, their rhythmic reading of ti-tika, their melodic writing of low la with solfa manipulatives, and their ability to identify instruments within a piece of music. The wide variety of these assessments allows you as the teacher to truly get a picture of well-rounded musicians within your school, and allows your students to "shine" and show what they truly know and can do! Any other ideas? Feel free to comment below. Have a great day! Love these ideas! I struggle with barred instruments and clef notes. When do you begin teaching these things? I do lots of high/low, story work, etc. with kindergarten and 1st grade on mallets, but I guess I don't know where to do from there. Our district is getting big into assessment right now, so this blog post is wonderful!